Inside NCECA Vol 2, No 14 – Who’s Who and how do you know? Today’s column is about giving you some inside information about who you need to know. The NCECA organization is supported by a stupendous staff of 8 led by our exceptional Executive Director, Josh Green. There really just aren’t enough words to accurately convey the magnificence of Josh. He has breadth of knowledge on a variety of topics not just related to clay, but also business and the running of a non-profit organization. He’s eloquent, intelligent & thoughtful in his communications, and fun to have an informal chat with. Our conference planner, Dori has been with the organization since the last Kansas City Conference in 2002, (when she was learning from our previous conference planner, Minerva Navarette (Minerva, by the way, still attends the conference each year!)) She makes the entire conference happen and does so with a calmness and grace that I can’t even fathom. Kate is NCECA’s Projects Manager. Among many other things, she works behind the scenes on the NCECA exhibitions, handles the Resource Hall for the conference, and proofreads EVERYTHING. Candice is NCECA’s Communications Manager. She began working with NCECA full time shortly after the Seattle conference. Candice manages all of NCECA’s graphic design work, everything on the NCECA website and also the enormous task of the NCECA App Jacqueline is the Office Manager…basically, she’s the person that handles just about everything the average member needs, from renewal of your membership to conference registration, and everything in between. Our amazing Bookkeeper, Helen, does an amazing job of managing an extremely seasonal cash flow, monitoring expenses, investments, balance sheets….and that doesn’t even begin to go into the NCECA budget that she prepares each year. 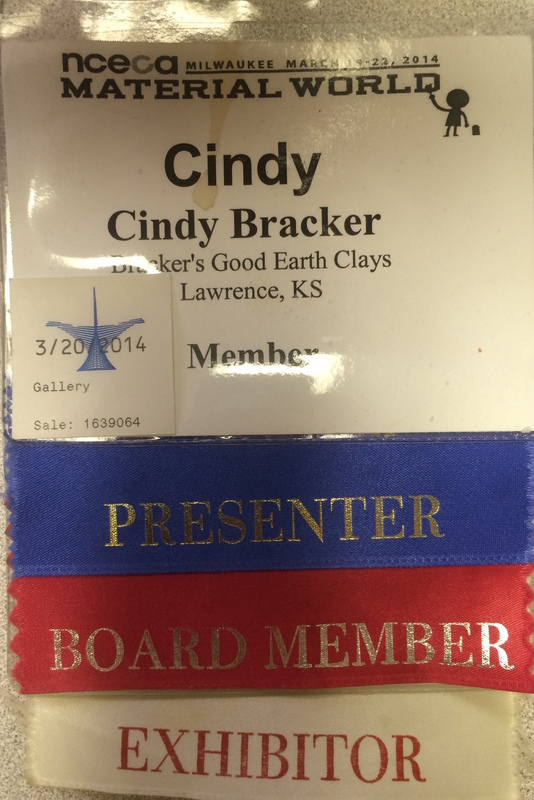 Most recently, NCECA has been joined by our new conference assistant, Tammy Lynn. She works extensively with all of the local exhibitions, conference registration and helps with the NCECA App. NCECA also employs a tech crew for conference. Most of them have been with NCECA for about 5 conferences and have been instrumental in adapting available technology to NCECA’s growing needs. They begin working on all of the presentations about 2 weeks prior to the conference, meet with each presenter to go over their slides and see that everything is working properly and try to make sure everything goes smoothly during the actual sessions. NCECA also hires some temp services to help with registration and check-in. I’m excited to tell you that we have a new system this year which we hope will streamline and speed up the entire process. Stay tuned for more detailed information about that! But in addition to all of those folks that might be able to help you out and answer your questions, you are sure to meet a bunch of new friends, and it may be helpful to have a little heads up about who these folks are before they even say a word. 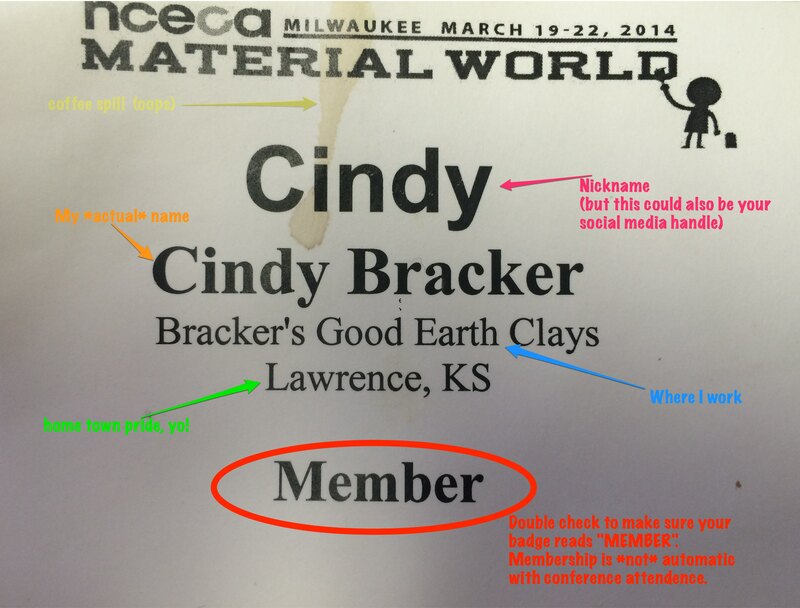 The NCECA name badge can be a very handy tool. (for the full effect, you should read that in a deep, echo-y announcer voice, possibly with some hero-esque background music…you get the idea). The next line is first and last name, followed by your affiliation – university, college, school, business, gallery, art center, non-profit etc. On the very bottom, I hope you see the word “Member” printed. Please note that for years your membership was automatically renewed with your conference registration. Because many people maintain their membership even when they can’t attend the conference, and because there are so many different levels of membership, it was separated out. • Your name badge can also be a convenient place to keep your business cards to hand out, but please keep them in the BACK of the pocket. • Of course, your badge can also be a bit of a fashion statement…I always end up with some bling on mine, from the marks I get from museums (like the Milwaukee Art Museum on my badge here) to buttons and pins I am given from some of my favourite folks (like this Robin Hopper Making Marks Pin I got in 2008). 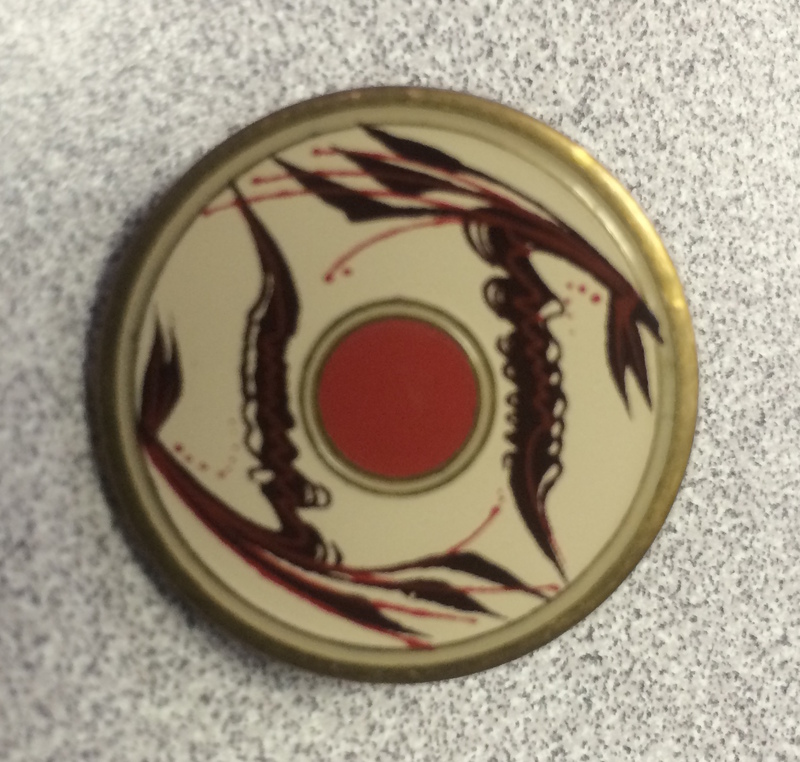 By the end of a conference, I think I’ve gained 5 pounds in pins alone, all adorning the string on my badge. I often feel like I should work in one of those restaurants. • Your badge can also grant you access to certain exhibitions and shows that might otherwise have admission fees. • Your badge is required for all the programming sessions EXCEPT the Opening Ceremonies on Wednesday Night, so bring your friends to our fabulous Keynote and Randall Session! • Your badge is required for entrance into the Resource Hall, however, if you brought some friends with you, they can still experience a taste of NCECA in the Gallery Expo area, which is open to the public. WAIT JUST A MINUTE…..you mean I have to have my badge to “go shopping”? What’s that about? Shouldn’t the Resource Hall be free? colleges and universities and now residencies and arts centers doing their best to attract students. On top of all that are the reunions of old friends in the middle of an aisle, the demonstration in that booth over there, and the book signing by the well-known author in that other one over there and a drawing for a free thingamajig in that one in the back of the hall.